I put 'eat cake' on my to do list, then I get at least one thing done. 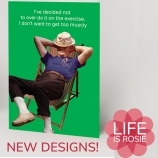 A fabulous card from our Life is Rosie Range. Folding greeting card 12cm x 17cm. Blank inside printed in the UK on recycled card. Comes with an envelope.